Control Super Monkey with the mouse. Hit ESC at any time during a wave to access the upgrades screen. Toss out a boomerang for extra poppage. Throw two boomerangs each time. Dispense with the rangs and move onto explosives. Two missiles are explode tastic. Throws two streams of darts. These missiles have degrees from Harvard, they seek out bloons. Each salvo unleashes four smart missiles. Only a really super duper supermonkey can throw four darts at once. Pop bloons just by looking at them. Solid unstoppable beam of bloon melting madness! Seeks out and pops nearby bloons automatically and instantly. Three for the price of three. This is like liquid sun. For those who don’t like to aim much. More popping power than you could ever need, want or afford. Twin guided missles that packed extra punch, especially to MOABS. 4 x MOAB Maulers for extreme bloon wreckage. i beat your stupid score andy i got 16841 points! would you want to have a score battle with me? Nalnil i’m suprised you got this much blops once you beaten this level. Nainil it is actually that much pops on the very last wave. by the way you seem to follow this guide pretty well. so what is your highest score at the end? tip on each wave on stage 5: when you see spaceships with the rainbows as it’s body with browns on the side, go and shoot right on top of it, there will be a lag but don’t worry, after the lag is off, your pops will greatly rise, try doing it on each ships to aim for a epic score! 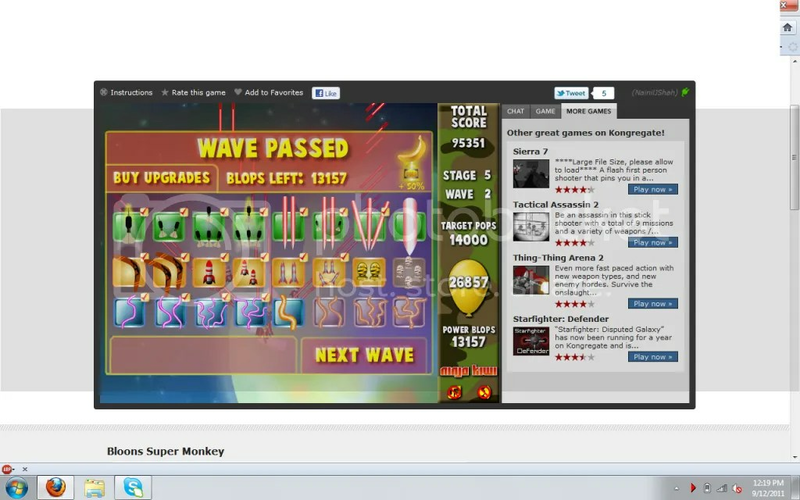 hehehe can anyone beat ‘630747’ pops on stage 5 wave 3! i got super lucky! I beat you one wave early. Here’s a screenshot to prove it. Unless you meant pops on one stage. why the heck i can’t get gold on stage 3, wave 3!? AAWW ( Didn’t follow directions) Failed 5-3… Needed like 38 more! yeah right you probably spent 4 hours trying to got one gold failed tried to kill your self got told you are adopted and are now munching on your B**** flakes and crying in a corner. lvl1 bomerang200 lvl1 darts 400 (lvl1)(if can upgrade bomerangs to 2) then second lvl upgrade tangels lvl1 500 and when you get 1000 get tangels lvl 2 dont upgrade bomerangs go on till 2500(in order this to work get you concentration together and focus!) well hmm you should see you got stage one all gold stage 2 is easy upgrade to missles when you see the yellow arrows thats where it starts to get heavy here on go to 4darts bla blaa go onn you’ll see you need those lasers from here on focus on those lasers and your done haha! goodluckk mateys. This walkthrough is DECENT. It will get you through the game but it won’t get you any kind of high score. The problem is it emphasizes the missiles too early on. You will notice how well you’re doing the first few levels and think, “Great!”. But soon you’ll realize that this walkthrough is only helping you get the final laser before the game actually ends, which is (the laser) hard to get. But that laser only does so much the last level or TWO to raise the already weak score you have. Last. Personally, I’d focus on the tentacles a little more. I achieved my score of 92,000+ progressing with those before the missiles. I only achieved 82,000 with this walkthrough. Like I said. If you want the major killer laser, follow this walkthrough. I never get it, so I’ll admit it was nice. But if you want a high score, you’re looking somewhere completely else. i never upgrade to death ray. i just upgrade everything else and if i have enough then i get it. Hey there, thanks to the upgrade cost listing, I managed to finish the game. I upgraded everything to full, except MOAB Maulers. 2. For the Boomerangs/Bombs upgrade stream, only upgrade till the Quad Seeking Missiles upgrade. The MOAB upgrade is completely useless because you’re aiming to keep the MOABs around till you hit your target bloons. 3. For the Tentacle upgrade stream, only upgrade till the first QuadPlasma Tentacle until you can afford the Quad Super directly. (In other words, keep the Quad Plasma Tentacles until you can afford the $20000 needed for the direct upgrade to Quad Super. This is how I managed to beat the game. These upgrades are easily achievable at the beginning levels, and can pop a whole lot of bloons. I got Gold achievements in the last 5 levels of the game through this. (World 4-2 onwards). Bloons fan, isn’t level 5-3’s goal is to pop 14000 bloons. Because What you’re saying about the goal is level 5-2. That’s where I lost too, when I didn’t destroy the BFB. You didnt mention how to turn into a SunGod monkey or and explode the whole screen bomb or a freeze ballon. I did all of these but I just cant figure out how I did them. It has something to do with the blue dots. No it doesn’t those are powerups, they’re hard to see because of all the bloons, but there is a bomb that floats around, hitting it blows up everything on screen, there is an icecream that freezes everything, and i dunno what the sungod one looks like. The blue dots increase your upgrade points. I have very good Sight so I can Easily see them Tricky Powerups. Hi, Ayumi! It’s me, KR! Remember from that post on BTD4? I cant pass 4-1 so i just have to shoot the red baloons and not kill the MOABS? I’ve Reached level 5-3 and failed. The goal for the level 5-3 is to pop 11000 bloons.